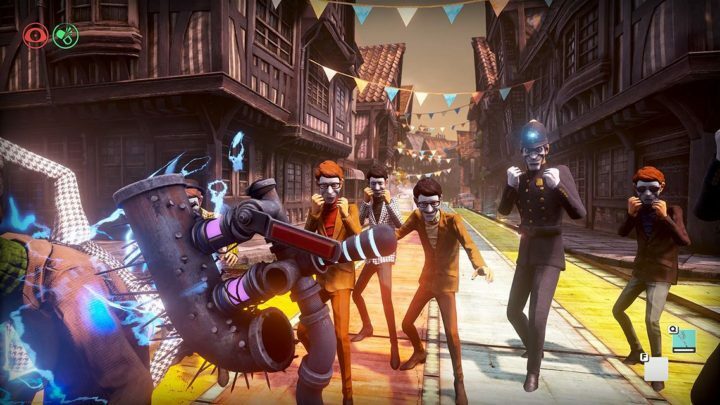 We Happy Few is an indie survival horror game developed and published by Compulsion Games. In this game, everyone is controlled by a personality-altering pill called Joy. You will play as Arthur Hastings, a redactor who erases unhappy stories from the record. However, during his work, he finds an article about his brother Percy and experiences a sudden flashback. And because of this flashback, he decides to not take Joy anymore. By doing this, he finds out the real world is much different from what he usually experiences. The game is expected to be released for Linux, Windows PC, MacOS and Xbox One, but on July 26, 2016 was released as a Game Preview on the Xbox Store, Steam Early Access, Xbox Store and GoG Games in Development platforms. According to the Steam page, We Happy Few early access will be up for anywhere between six and twelve months, so it seems that the game will not be released anytime soon. – Watch out for traps and lure your enemies into them. Have you tested out the preview version of We Happy Few on your Xbox One console or Windows PC? Tell us your thoughts about it!